As discussed in the previous post, chemicals from plastic containers and wrappers may not be as safe as industry and regulators would like us to believe. Polycarbonate can release BPA, and compounds such as phthalates are added to PVC to make it softer and less rigid. The main concern surrounding these compounds is the way they have been shown to be endocrine disruptors. That is, they mimic and disturb our body's hormones. Some plastic containers are more dangerous than others. 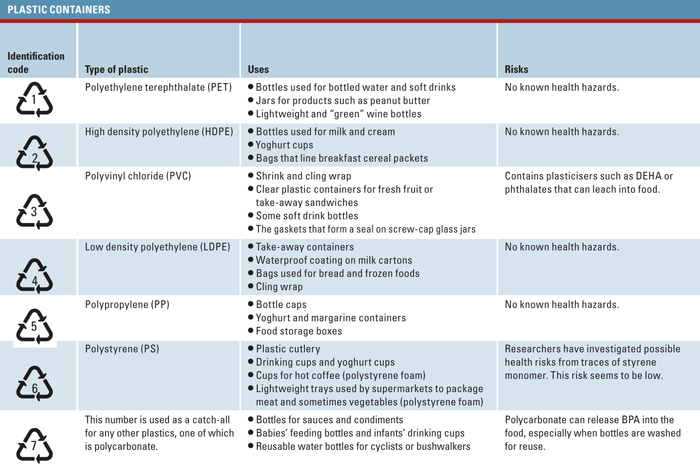 If you are concerned, and would like to minimise your exposure, use the table below to see which ones are best avoided. The table is taken from a fantastic article on Choice online, and can be found here. You can often identify the type of plastic from its identification code – unfortunately, this code is voluntary and you won’t find it on all plastic packaging. Look for the codes 1 (PET), 2 (HDPE), 4 (LDPE), 5 (PP) and 6 (PS). 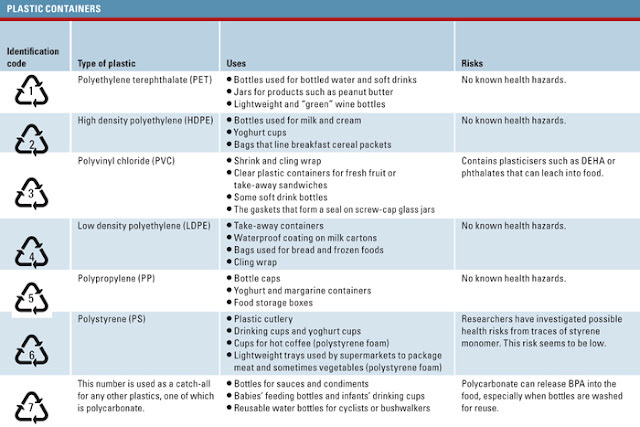 Whenever possible avoid foods or beverages that have been in contact with plastics with the symbol 3 (PVC) or 7 (a catch-all category that includes polycarbonate). Many packaged foods are in plastic containers that seem to be harmless. Soft drinks and bottled water are usually in PET bottles, for example, while yoghurt and margarine containers are usually made from polypropylene. There’s clearly no real need for food manufacturers to use packaging or wrapping made from polycarbonate or PVC, but there are still far too many products in the supermarkets where the food is in contact with these potentially harmful plastics.